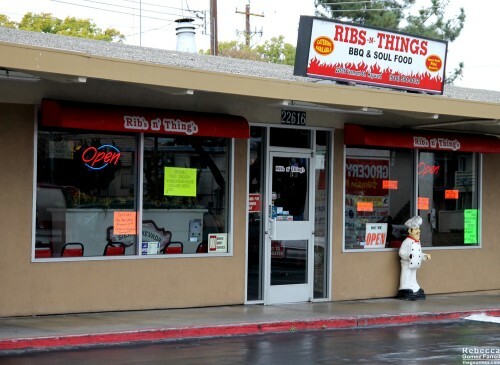 This was my second visit to Ribs ‘N Things, and I was as impressed by this soul food and barbecue joint as I was the first time. 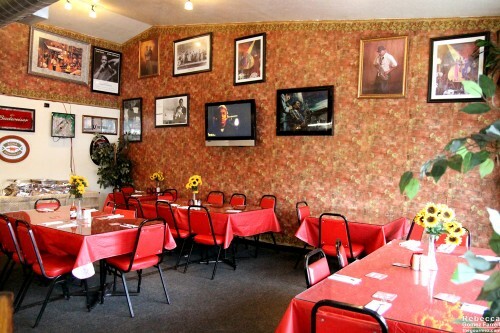 That first time, we were waited on for dinner in their modest dining room decorated with jazz paintings. The dining room is roped off sometimes, but they are happy to seat you whether or not it looks unavailable. Service was lacking when we ate in, but that’s because this is a small, family-owned operation and chances are the person taking your order is also the one who’s going to cook it for you. Both my husband and I were starving and had our own helpings of the steak tips dinner. That was a giant mound of steak swimming in a luscious barbecue sauce that held plenty of spice and enough tang to make it unique. It was just what we’d both been wanting. And boy did Ribs ‘N Things satisfy again the next time I had a craving, this time for fried chicken. The chef/cashier made sure I knew he’d cook the fried chicken fresh so it would take a good 10 to 15 minutes, which I didn’t mind one bit. I minded even less after I took it home. 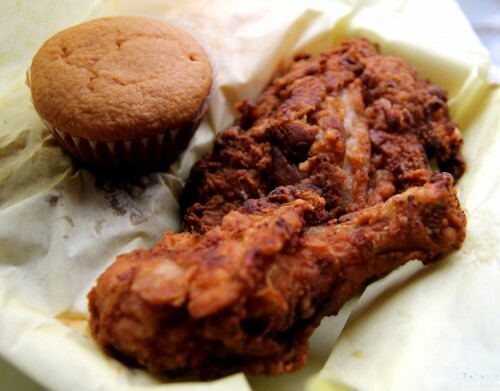 World, that was some amazing fried chicken. Just this side of too salty, so my taste buds craved that next bite of the rich, red, fried coating and moist chicken. The leg disappeared within seconds of my opening the container. There’s a healthy dose of pepper in the coating that contributes to its savory siren’s call. 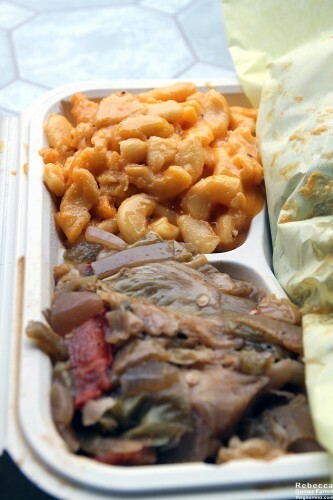 Dinners come with your main meat, two sides, and a cornbread roll. The cornbread was dry and a little stale, though it had a pleasant, sweet flavor. I don’t remember it being dry that first night, so this may have been a bad roll. The mac and cheese is a-mah-zing. I don’t want you thinking this is a healthy treat—it was loaded with cheddar cheese and butter and had the grease pool to prove it. The cheddar was bold and bolstered by seasoning salt in the mix. I hadn’t had fried cabbage before and that also proved delicious. There might be a touch of fennel in it, which is catnip to me, but most of the flavor came from a bell-pepper-rich sauce. Ribs ‘N Things also makes their own pies, and I couldn’t pass up a slice even though they’re a bit on the pricey side ($4.75). Selections vary daily. Pecan pie was my choice. I tasted (or imagined) some rum or bourbon in it, which really livened it up. The crust bottom was burnt, but I couldn’t bring myself to care, so satiated I was with all things greasy, salty, and finger-lickin’ good. 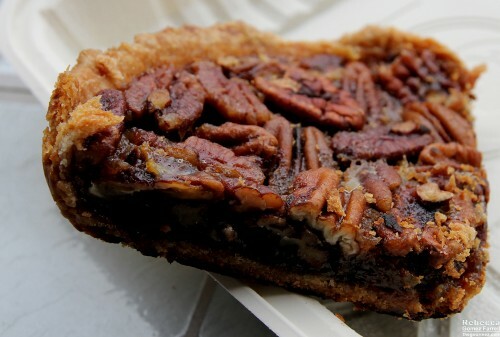 The pecans were on the edge of chewy, and the filling was really dense and really tasty. Yum. 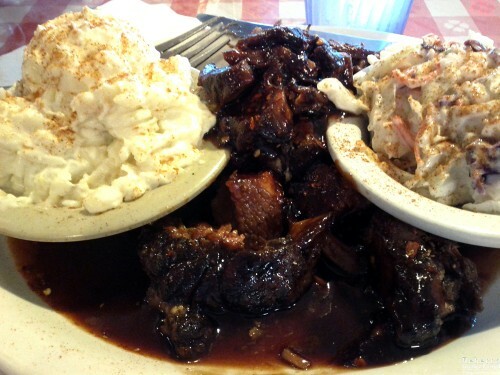 Look, Ribs ‘N Things isn’t faultless. The corn bread was a miss, and pies shouldn’t be burnt. But those flaws are just part of what makes this place perfect. Reviewed Sept 2013 and 29 Jan 14.